The infection will then attempt to find a live Command & Control server by connecting to domains generated by a Domain Generation Algorithm . Some examples of domain names that the DGA will generate are lcxgidtthdjje.org, kdavymybmdrew.biz, dhlfdoukwrhjc.co.uk, and xodeaxjmnxvpv.ru. Once a live C&C server is discovered it will communicate with it and receive a public encryption key that will be used to encrypt your data files. It will then store this key along with other information in values under the registry key under HKEY_CURRENT_USER\Software\CryptoLocker . Unfortunately, the private key that is used to decrypt the infected files is not saved on the computer but rather the Command & Control server. When it has finished encrypting your data files it will then show the CryptoLocker screen as shown above and demand a ransom of either $100 or $300 dollars in order to decrypt your files. This ransom must be paid using Bitcoin or MoneyPak vouchers. It also states that you must pay this ransom within 96 hours or the private encryption key will be destroyed on the developer’s servers. It is important to note that the CryptoLocker infection spawns two processes of itself. If you only terminate one process, the other process will automatically launch the second one again. Instead use a program like Process Explorer and right click on the first process and select Kill Tree . This will terminate both at the same time. Paying the ransom will start the decryption process of the CryptoLocker infection. When you pay the ransom you will be shown a screen stating that your payment is being verified. Reports from people who have paid this ransom state that this verification process can take 3-4 hours to complete. Once the payment has been verified, the infection will start decrypting your files. Once again, it has been reported that the decryption process can take quite a bit of time. Newer variants of CryptoLocker appear to be dynamically generating new bitcoin payment addresses for each instance of an infection. You can use the links above to see transactions into the wallet and out of the wallet. CryptoLocker only encrypts data stored on network shares if the shared folders are mapped as a drive letter on the infected computer. Despite what some articles state, CryptoLocker does not encrypt data on a network through UNC shares. An example of a UNC share is \\computername\openshare. It is strongly suggested that you secure all open shares by only allowing writable access to the necessary user groups or authenticated users. This is an important security principle that should be used at all times regardless of infections like CryptoLocker. 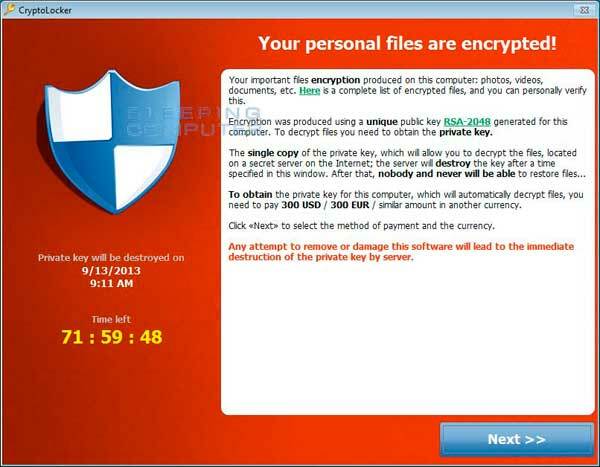 When the CryptoLocker is first shown, you will see a timer that states you need to pay the ransom within 96 hours. Some people have reported that you can increase the time by rolling back the clock in your BIOS. So to increase the timer by 10 hours, you would change your clock in your BIOS to 10 hours earlier. The virus author has stated that using this method will not help. They have said that the private key required for decryption will be deleted from the Command & Control server after the allotted time regardless of how much time it says is left on the infected computer. People have asked how they can contact the author of this infection when their payment does not go through. There is no direct way to contact the developer of this computer infection. They are, though, monitoring the various threads about this infection, including our CryptoLocker support topic , and have responded to infected user’s issues as well as to give other messages on the home page of their Command & Control servers. The address for this Command & Control server can be found on the desktop wallpaper on an infected computer. The url that they specify to download the decrypter, can also be used to view the messages from the author. Simply go to the home page rather than the executable. So if the wallpaper has an URL of http://kjasdklhjlas.info/1002.exe, to see the message you would go to http://kjasdklhjlas.info/. Please note that this url is not valid. To restore individual files you can right-click on the file, go into Properties , and select the Previous Versions tab. This tab will list all copies of the file that have been stored in a Shadow Volume Copy and the date they were backed up as shown in the image below. 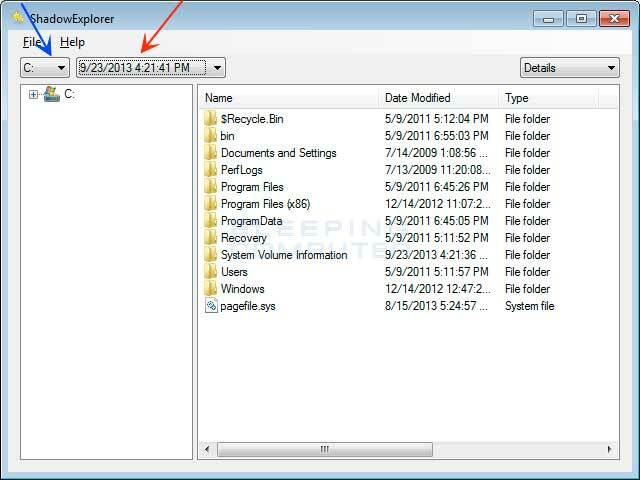 To restore a whole folder, right-click on a folder name and select Export . You will then be prompted as to where you would like to restore the contents of the folder to. Under these keys you will see Value names with data that appears to be garbage data (encrypted info). The droppers will also be found in the %Temp% folder and the main executable will be stored in a random folder under %AppData% . Last but not least, a startup will be created under HKCU\Software\Microsoft\Windows\CurrentVersion\Run to launch it. In order to block the CryptoLocker and Zbot infections you want to create Path Rules so that they are not allowed to execute. To create these Software Restriction Policies, you can either use the CryptoPrevent tool or add the policies manually . Both methods are described below. FoolishIT LLC was kind enough to create a free utility called CryptoPrevent that automatically adds the suggested Software Restriction Policy Path Rules listed below to your computer. This makes it very easy for anyone using Windows XP SP 2 and above to quickly add the Software Restriction Policies to your computer in order to prevent CryptoLocker and Zbot from being executed in the first place. Once you run the program, simply click on the Block button to add the Software Restriction Policies to your computer. 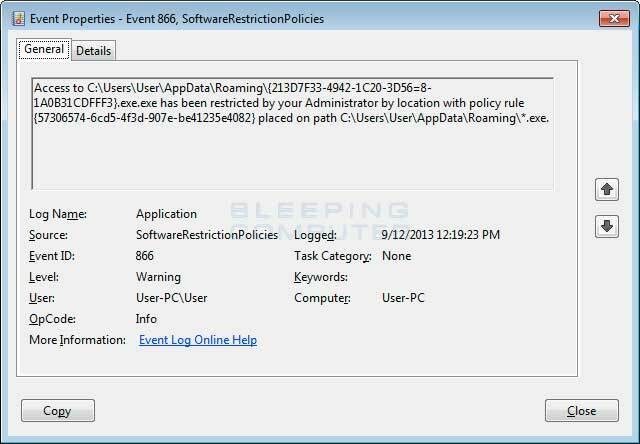 To manually create Software Restriction Policies you need to do it within the Local Security Policy Editor or Group Policy Editor. If you are a home user you should create these policies using the Local Security Policy editor. If you are on a domain, then your domain administrator should use the Group Policy Editor. To open the Local Security Policy editor, click on the Start button and type Local Security Policy and select the search result that appears. You can open the Group Policy Editor by typing Group Policy instead. In this guide we will use the Local Security Policy Editor in our examples. Once you open the Local Security Policy Editor, you will see a screen similar to the one below. Once the above screen is open, expand Security Settings and then click on the Software Restriction Policies section. If you do not see the items in the right pane as shown above, you will need to add a new policy. To do this click on the Action button and select New Software Restriction Policies . This will then enable the policy and the right pane will appear as in the image above. You should then click on the Additional Rules category and then right-click in the right pane and select New Path Rule… . You should then add a Path Rule for each of the items listed below. Below are a few Path Rules that are suggested you use to not only block the infections from running, but also to block attachments from being executed when opened in an e-mail client. Description: Don’t allow executables to run from %AppData% . 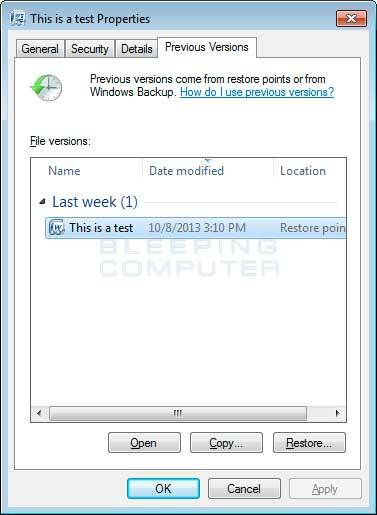 If you need help configuring this, feel free to ask in the CryptoLocker help topic . If you use Software Restriction Policies, or CryptoPrevent, to block CryptoLocker you may find that some legitimate applications no longer run. This is because some companies mistakenly install their applications under a user’s profile rather than in the Program Files folder where they belong. Due to this, the Software Restriction Policies will prevent those applications from running. Thankfully, when Microsoft designed Software Restriction Policies they made it so a Path Rule that specifies a program is allowed to run overrides any path rules that may block it. Therefore, if a Software Restriction Policy is blocking a legitimate program, you will need to use the manual steps given above to add a Path Rule that allows the program to run. To do this you will need to create a Path Rule for a particular program’s executable and set the Security Level to Unrestricted instead of Disallowed as shown in the image below. Once you add these Unrestricted Path Rules, the specified applications will be allowed to run again. %UserProfile% refers to the current user’s profile folder. By default, this is C:\Documents and Settings\<Current User> for Windows 2000/XP, C:\Users\<Current User> for Windows Vista/7/8, and c:\winnt\profiles\<Current User> for Windows NT.